This is a delicious vegan avocado wedges recipe from my collection of healthy avocado recipes. You can easily make this in an airfryer or oven. Do try. 1 tsp. mixed herbs like oregano, basil etc. Cut avocado into wedges and remove the skin. Keep aside. Mix together breadcrumbs, herbs, cayenne and salt. Dip avocado wedges in the breadcrumbs coating so that they adhere well and keep aside. Preheat Airfryer to 180 degrees for 6 minutes. 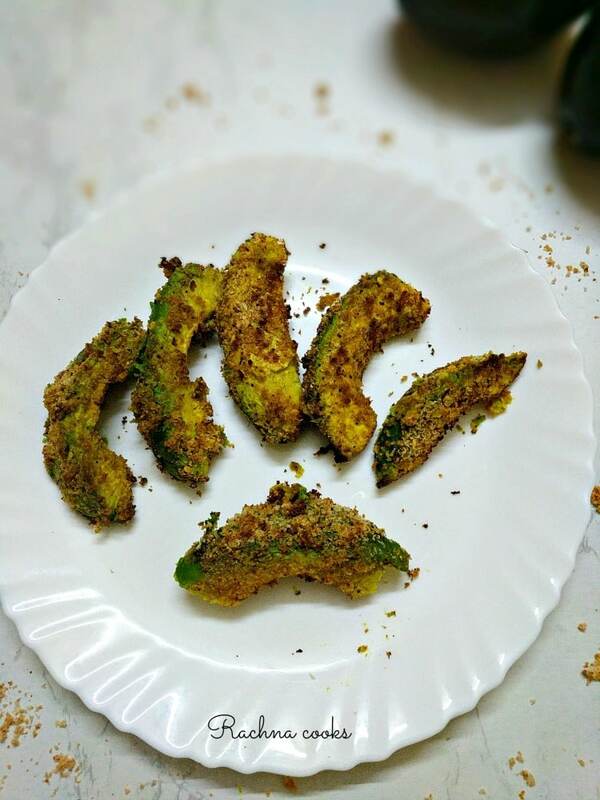 Brush airfryer basket and breaded avocado wedges with oil. Now spead out the wedges in the airfryer basket and airfry for about 10 minutes at 180 degrees. Remove hot when the crumbs look golden brown and crunchy. Serve hot with a hot sauce or green chutney. Only use ripe avocados that are not mushy. You can use any combination of herbs with your breadcrumbs. If you want conventional wedges, use a combination of flour (with salt and cayenne), beaten egg and breadcrumb mix. Dip each wedge first in flour, then in egg wash and finally bread it. Then airfry or bake it. You will get a thicker coating in your wedges. If you have an oven, bake your wedges for 10 minutes each side at 200 degrees C.